In response to a question recently in the European Parliament from Mairéad McGuiness MEP, one of the Parliament’s Vice Presidents and a member of COMAGRI, the Commission presented updated figures on the distribution of the value added in the food chain between the various actors. Mairéad McGuinness had asked if the Commission could provide details on the average share/percentage of the final price that farmers receive for their produce, relative to the share/percentage received by other actors in the food supply chain? 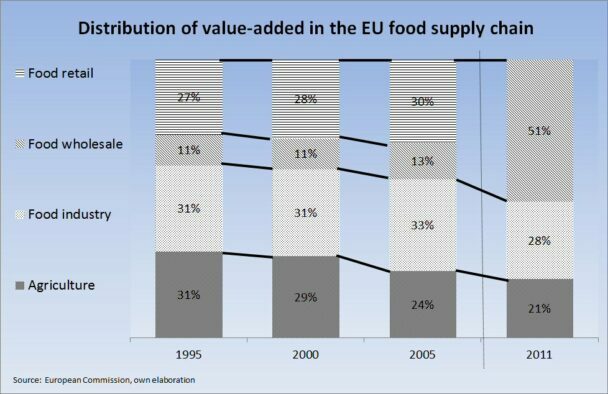 The Commission had previously presented figures for the distribution of value added in the food chain between the years 1995 and 2005 in a staff working paper accompanying its communication A better functioning food supply chain in Europe in 2009. 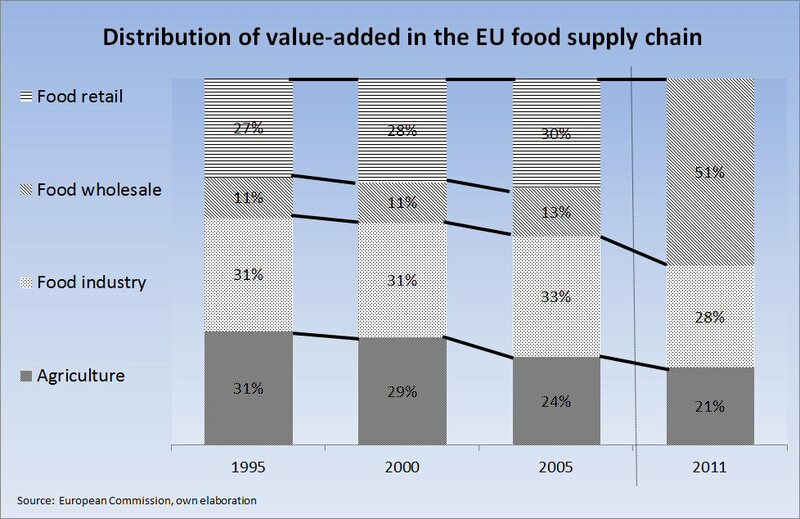 This analysis showed that value added for agriculture in the food chain dropped from 31% in 1995 to 24% in 2005, mainly in favour of other food chain actors. According to the Commission answer, available Eurostat data now show, although using a different methodology, that farmers’ added value in the food chain was at around 21% in 2011, versus a value added of around 28% for the food industry and of 51% for food retail and food services taken together. These trends are graphed in the figure below. For Ms McGuinness, the figures are evidence that farmers’ share of consumer spending on food is being inexorably squeezed by an imbalance of power between producers and retailers and other layers of the food supply chain which needs urgently to be addressed. At the same time we are demanding that farmers invest in more sustainable food production systems sensitive to concerns about the environment and use of scarce national resources. These demands cannot be met by relentless pressure on producer prices and their margins. The powerful in the food chain are imposing conditions on the powerless in an unfair manner, leading to reduced margins, impossible specifications demand and poor returns for investment outlay. Because this confusion was partly caused by the Commission itself, it is worth explaining in greater detail why changes in the distribution of value added along the food chain shed no light on, and cannot be used to make statements about, the evolution of bargaining power along the food chain. In arguing that the chart above tells us nothing about the bargaining power of farmers or any other segment of the food chain, we should first note that the figures themselves are highly uncertain. The Commission explains that the figure for the retail expenditure on food is derived from the Eurostat Structural Business Statistics database, and combines data for retail sales in non-specialised stores with food beverages or tobacco predominating, and retail sales of food, beverages, tobacco in specialised stores. As any shopper will notice, grocery stores whether specialised or not sell a wide range of non-food items. The Commission relies on Eurostat to make an estimate of the share of the value added in the distribution of food products alone (in 2005 food distribution accounted for 25 to 30% of total distribution activities). Small errors in apportioning the share of total retail value added to food can make a big difference to the estimated relative importance of value added accruing to different segments in the food chain. It is also not clear from the Commission’s explanation in its 2009 publication how food imports and exports are treated. It would seem that all of the value added in food processing, wholesaling and retailing is assumed to derive from processing and distributing domestically-produced food. If proper allowance were made for the share of imported food in processing and distribution activities, not only would the value added in these sectors relative to the agricultural value added be smaller, but also the growth over time might be quite different. Offsetting this factor is that a portion of domestically-produced food is used in the food service sector (hotels and restaurants) or may be exported and it is also not clear how this factor is taken into account. 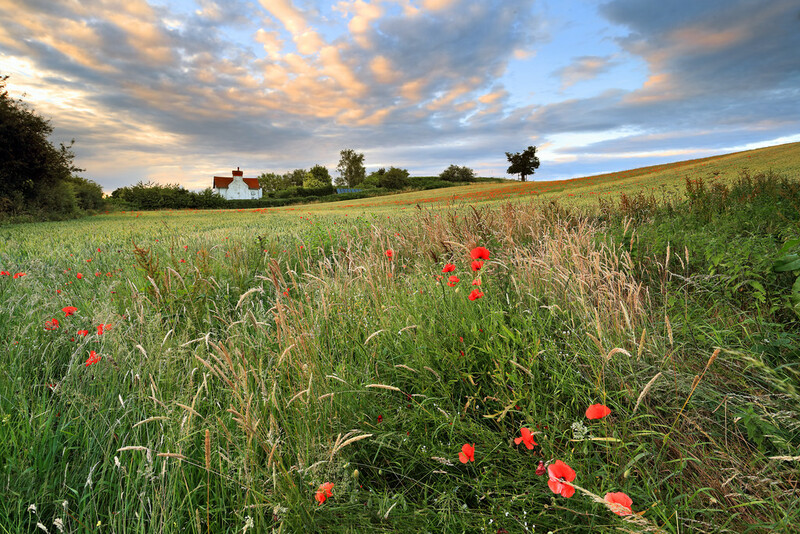 Another statistical issue is that value added in agriculture is influenced by the different treatment of agricultural subsidies following the Fischler CAP reform in 2005. This reform led to the introduction of the Single Farm Payment which is classified in the Economic Accounts for Agriculture (EAA) as a subsidy on production and which replaced the system of direct product-related payments, which were classified as subsidies on products. This statistical reclassification alone led to a sharp fall in the figure for gross value added in agriculture at basic prices from 2005 on and which is reflected in the percentages in the chart above. This fall in agriculture’s value added was due to a deliberate policy shift, and had nothing to do with changes in bargaining power along the food chain. A final statistical issue is that the 2011 figures have been calculated on a different basis to the earlier ones. In particular, it appears that value added in the food service sector has been added to the value added in the food retail sector. If this means that the value added in the catering and restaurants sector has been added to the value added in food retailing in 2011 but not in previous years, it is hardly surprising that we observe a further fall in the farm share of consumer expenditure on food (now including catering and restaurants). But it has nothing to do with the exercise of bargaining power in the food chain. What does the marketing bill tell us? However, the main criticisms of this series as an indicator of bargaining power in the food chain are conceptual rather than statistical. The difference between what farmers receive for their produce when sold to first handlers (processors or consumer markets) and what the consumer eventually pays for this produce is what the Americans call the marketing bill. It represents the cost of all of the goods and services required to assemble, transform, pack, transport, store and eventually deliver this produce to the final consumer. Trends in the marketing bill are fundamentally affected by changes in the composition of the products that consumers buy. Think of how the dairy cabinet of a supermarket has changed in the twenty years since 1995. What originally might have been a limited display of liquid milk, butter and some basic cheeses has exploded into a wide array of yogurts, different qualities of liquid milk, a vast variety of cheeses, dairy nutritional drinks and so on. Similarly, beside the brightly-coloured array of fresh vegetables in the fruit and vegetable section, the freezer section of supermarkets has expanded with a much greater selection of frozen fruit and veg, pizzas, ice-cream, pastry products and so on. The meat section has expanded beyond basic cuts of meat to include ready-meals, marinated meats, meats with sauces and other butchery products designed to reduce the preparation time in the home. Common to all of these more recent additions is that they are value-added products in which various additional services or processing have been added to the basic raw material. Slow food advocates may regret that the rising opportunity cost of time has led to the growth of convenience foods. However, the rising share of the marketing bill in consumer food expenditures is explained by this trend. It says nothing about the trend in bargaining power in the food chain. Other indicators of farm-to-fork margins are available. In 2009, the Commission published the first version of the European Food Price Monitoring Tool which is intended to increase market transparency in the food supply chain. The tool makes it easier to compare changes in prices by making available, in a single database, price indices for agricultural products and foodstuffs at various stages of the food supply chain for a selection of product groups (e.g. grain, flour and bread). A document accompanying the 2014 final report of the High Level Forum for a Better Functioning Food Supply Chain provides some summary comparisons of price trends for basic agricultural goods, foodstuffs at the manufacturing stage (‘producer price’) and at retail level, drawn from this Monitoring Tool. 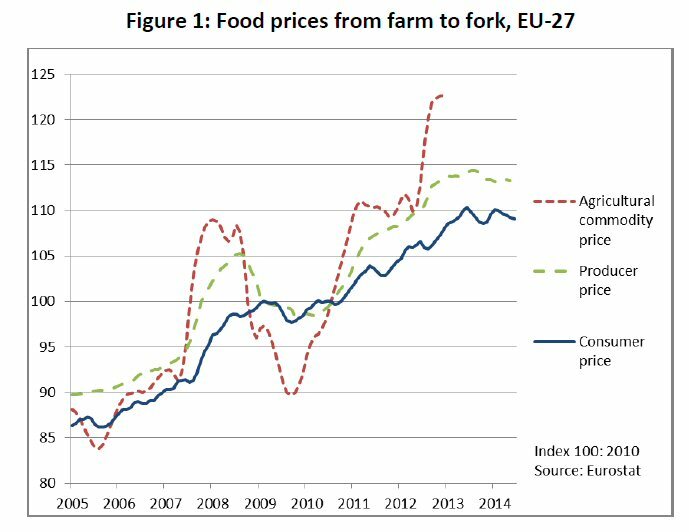 In the nine years from May 2005 to May 2014, retail food prices increased by 25%, while prices at the manufacturing stage rose by 26% (see figure below). Unfortunately, the agricultural price index series is incomplete because of technical problems in compiling the series at the time this report was published. Eurostat still has no aggregate EU agricultural price index available on its website, but looking at individual countries it is clear that prices have fallen back from their peak in December 2012 shown in the figure below. However, the fall in farm prices between 2012 Q4 and 2014 Q2 seems to average out at around 7-8%, which would still leave the growth in farm prices in May 2014 well ahead of the growth in retail prices as compared to May 2005. Ms McGuinness’s press release should have congratulated farmers on increasing their share of consumer spending over this period, rather than arguing that their share has been decreasing. Of course, simply comparing price trends at different levels of the food chain can also be misleading. The product weights in the basket of agricultural commodities are different to the weights used to aggregate consumer prices. The Food Price Monitoring Tool enables users to carry out more specific analysis for more detailed product categories. In its 2014 report, the High Level Forum looked at farm-retail price spreads for a number of specific farm products (cereals and bakery products, sugar-based products, and animal and vegetable oils and fats). While little can be concluded from the sugar case study because the 2006 reform led to a deliberate reduction in sugarbeet prices over four years compensated by direct payments, farmers increased their share of final expenditure for both cereals and oilseed products since the Monitoring Tool was introduced. These trend comparisons for prices at different levels of the food chain are sensitive to the particular time period considered. Over a longer time period, it is possible that the growth in farm prices has lagged behind the growth in consumer food prices. However, whether the farm share of the retail price goes up or down over a particular period casts no light on Ms McGuinness’ key concern, whether farmers are being screwed in the food chain. Producer welfare is fundamentally determined by the return to a farmer’s investment and labour. Factor productivity increases more rapidly in agriculture than in manufacturing, let alone services (largely due to the rapid outflow of labour from the sector). Because productivity increases more rapidly, the producer’s share of supply chain value added can fall without adversely affecting his or her return on investment and labour. The point is not to argue that market power does not exist in the food supply chain, and that farmers and consumers can be harmed by this. Indeed, competition authorities have found numerous examples of cartel behaviour in the food industry (most recently, among yogurt firms in France). The point is to argue that using misleading and simplistic data series is not helpful to a proper debate on these issues. This post was written by Alan Matthews.